NOTE: This post is part of the Criterion Blogathon! To see posts from others in the Blogathon, check HERE. 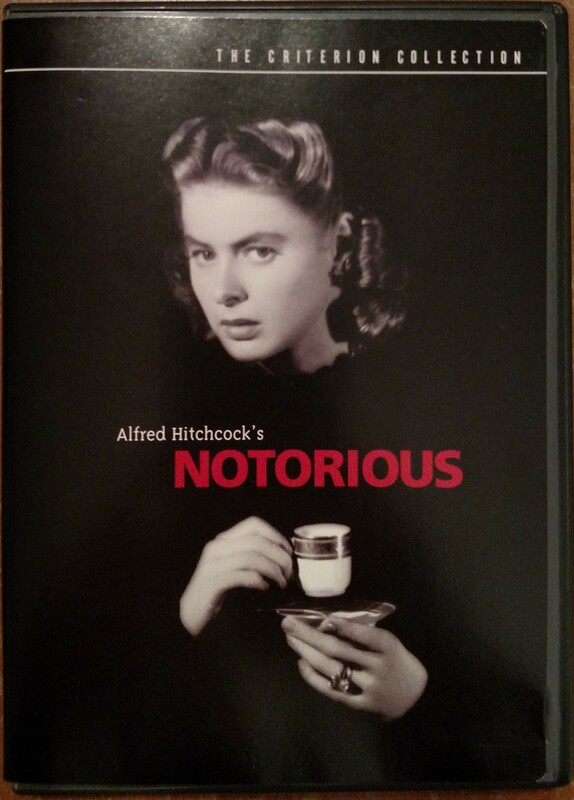 Alfred Hitchcock’s Notorious is not only one of my favorite films, but I can say without hyperbole that it is one of the most perfect films ever created. If you wish, you can find a synopsis of the plot online, along with the nearly unanimous critical praise for the film. In this post, I won’t be concerned about spoilers; this film is almost 70 years old, and therefore past any statute of limitations. Besides, it’s “not what a movie is about, it’s how it’s about it,” as Roger Ebert said. Contrast produces an immediate effect. Similarity satisfies us only in the long run. Contrast is an element of variety, but it divides our attention.Similarity is born of a striving for unity. … When variety tempts me, I am uneasy about the facile solutions it offers me. Similarity, on the other hand, poses more difficult problems but also offers results that are more solid and hence more valuable to me. Hitchcock’s medium, the cinema, is of course a dramatic one, involving the depiction of a story, and it engages the auditory sense through music and dialogue, but it is clear from his interviews that he considered it primarily a visual medium. He said that he himself had a “purely visual mind,” and was most interested in how he could use visual means to connect with the emotions and mind of the audience. In Notorious, even the musical soundtrack is relatively unmemorable compared to the many classic Bernard Hermann scores that would follow. This is not to say that it is poor or ineffective. Rather it is functional in a manner that serves the feel of the scenes without drawing any attention to itself or away from the viewer’s visual experience. 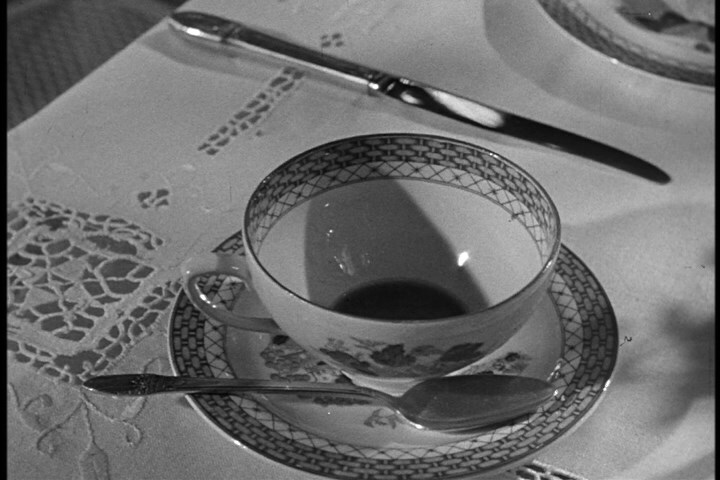 Hitchcock achieves the unity of design Stravinsky describes in this film by tying together all the strands with the singular visual motif of the drink. The drink serves as both plot device and metaphor, morphing its meaning according to the context of each scene. Through the use of such a compact and rich symbol, he is able to bring the viewer through a love story disguised as a spy story, taking them through the emotional twists of the story relying almost exclusively on a single motivic idea as a visual connector. I will present all the most notable examples from the film with a brief comment below. After the brief opening trial scene, we move quickly to the introduction of our lovers, with Alicia offering Devlin a drink at a party at her home. Milk of Magnesia never was photographed more lovingly. The morning after the party, Alicia is given a hangover remedy by Devlin. The drink here is the indicating the care that Devlin will take for her well being, both as her spy handler and as her would-be lover. This scene is also a parallel to a key scene late in the film when Alicia is rescued by Devlin. 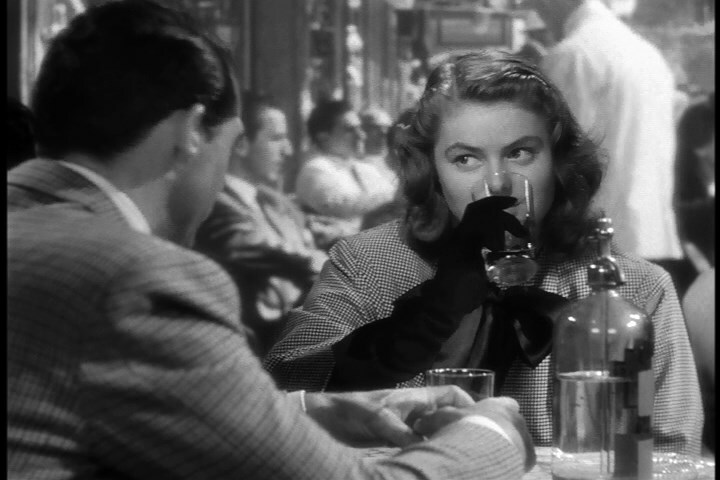 The romance between Devlin and Alicia first blossoms in this flirtatious scene over drinks in a Rio café. Devlin fetches a bottle of champagne to enjoy a dinner date with Alicia. On the way back to the apartment however, he stops by to receive orders which will ultimately drive Alicia into the arms of the Nazi criminal played by Claude Rains. The scene begins by panning up from this bottle to the conflicted Devlin. …which is destined to be left unopened. 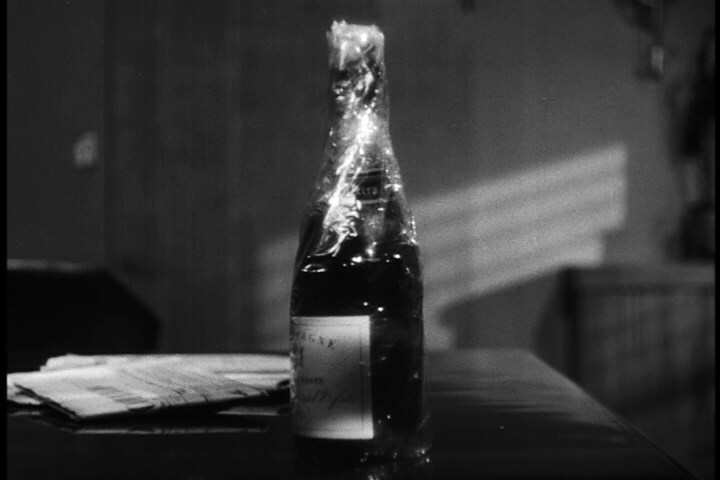 The scene ends by panning down to a shot of the abandoned bottle, a visual symbol foreshadowing that Devlin and Alicia’s romance will remain unconsummated. Standing in the room with her lover, yet still drinking alone. After the remarkable conversation in which Devlin delivers her instructions, and she accepts, Alicia moves into the room and pours herself what appears to be a stiff drink. 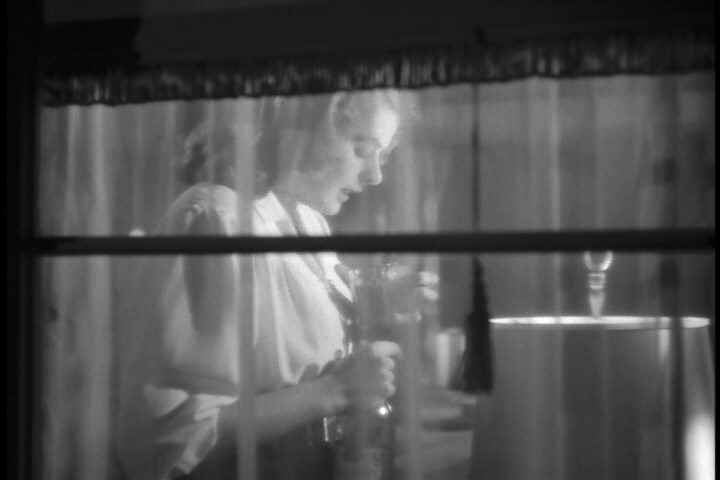 She is at once fortifying her nerve for the assignment ahead, and marking a possible return to the abuse of drink that she displayed earlier in the film. I note in passing that this is the only shot in the film where Hitchcock shoots through an obstruction like this curtained window. Through a visual separation from the camera, he marks the separation that has just taken place between the characters. Claude appears to love his cocktail olives. In this scene, Alicia has caught the Nazi, Alex Sebastian, in her trap of seduction. Of course this scene is a mirror of the earlier scene in the café, with Devlin now replaced by Sebastian. 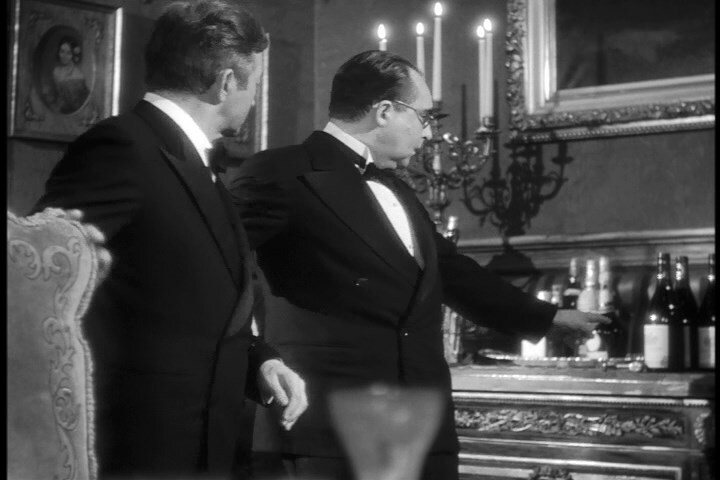 The visual unity of theme continues in the dinner party scene, where Alicia is introduced to the cast of villains. Here one of the Nazi conspirators betrays himself by pointing to the wine bottle, afraid that one of the ones being used to hide uranium samples has been set out to be served by mistake. Unfortunately, it was Emil who was mistaken, and his clumsy blunder will cost him his life. His fellow conspirators will deliberate and decide his fate, of course over after-dinner drinks. 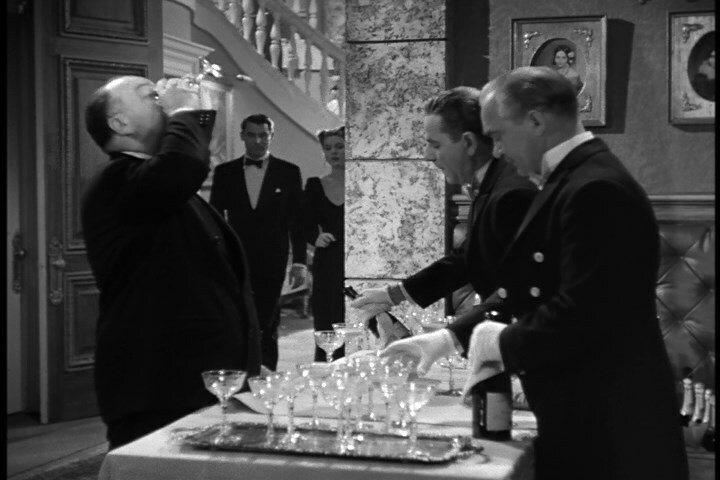 Even Hitchcock’s signature cameo involves a drink! 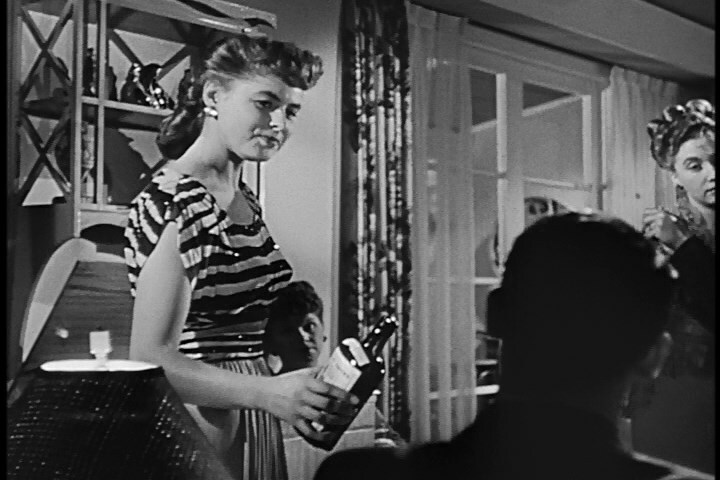 As Alicia and Devlin enter the room at the party in the central sequence in the film, the Master of Suspense is seen downing a glass of champagne. 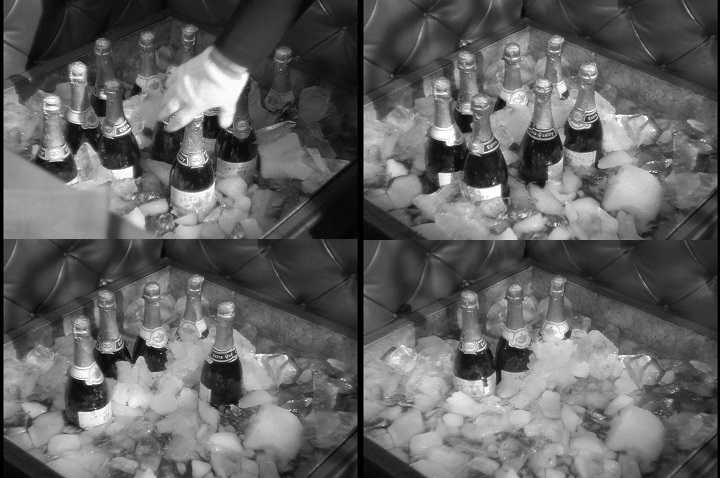 Here is yet another clever use of drinks…suspense is built by a series of four shots during the party sequence depicting the diminishing supply of champagne. When the bottles run out, Sebastian and his servant will come down to the wine cellar and discover Devlin and Alicia poking around in the forbidden room where the criminals have hidden their disguised uranium samples in wine bottles. 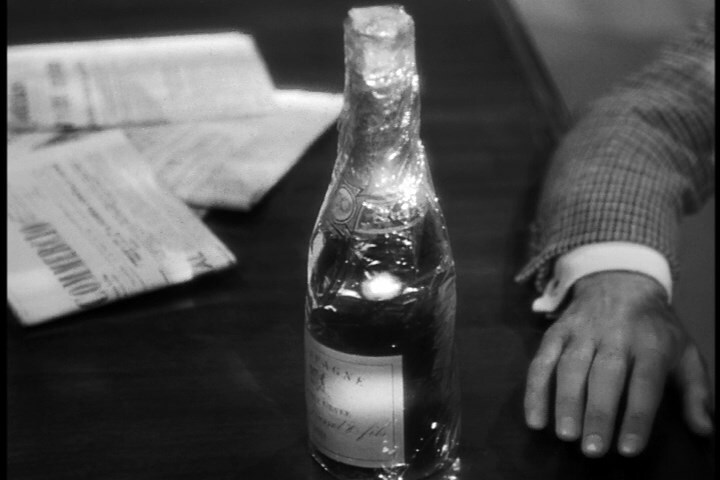 In a rapid series of edits, which illustrates Hitchcock’s brilliance in visual storytelling, the uranium is discovered when Devlin knocks a bottle to the floor, shattering it and spilling the contents. 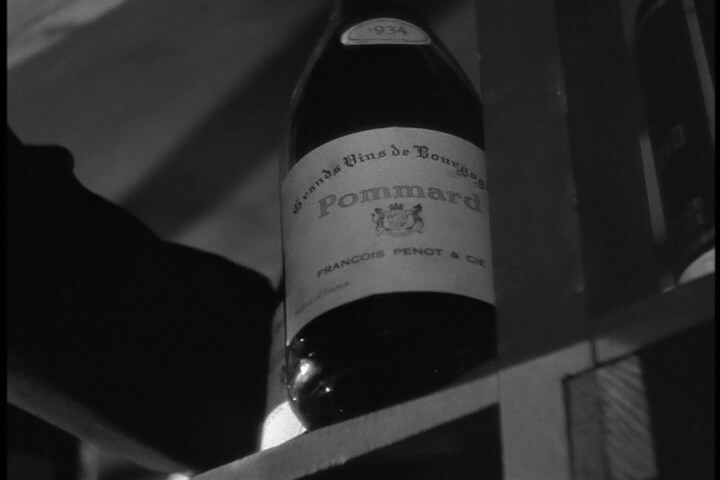 This sequence is incredibly dull on paper (Devlin explores a wine cellar and knocks over a bottle of wine, discovering the contents) but is in fact the most suspenseful scene in the film. In a film renowned for some brilliant long takes, this sequence is edited with a brisk pace and cuts between the action in the cellar and the “champagne countdown” upstairs to create maximum tension, again while staying with the single unifying symbol of the drink. It’s not even 9 in the morning, Sebastian, and you’re already at the bottle!. Alicia’s betrayal is discovered when Sebastian examines the wine cellar the next morning. A false bottle has been put in place of the broken one, and the false wife has been discovered. Coffee can be very bad for your health. 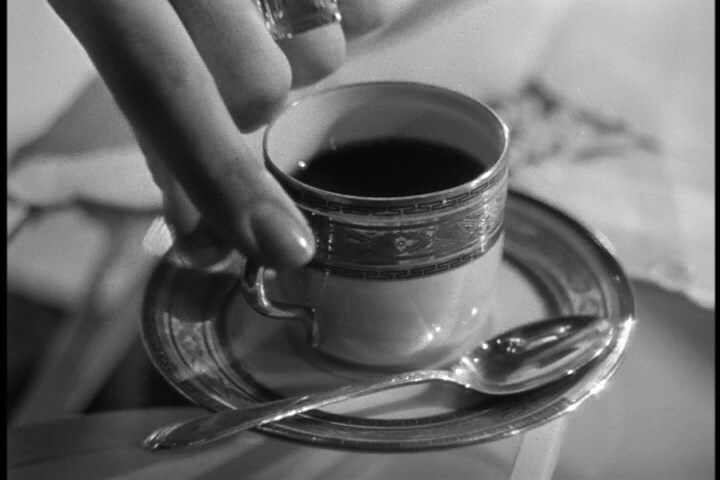 In the poisoning montage that follows Sebastian’s discovery and revelation to his wicked mother, several ominous shots of Alicia’s coffee cup are included. 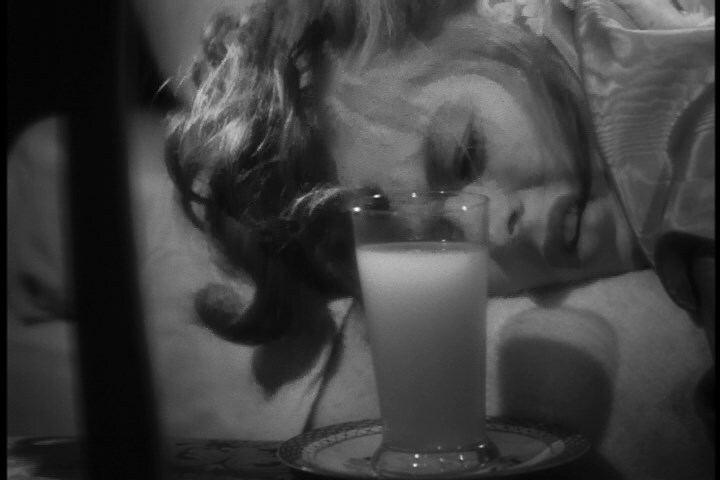 It is unclear to Devlin at first that she is becoming weak and ill from poison; he assumes that she has returned to the liquor bottle to cope with the strain of her situation, tying the climax of the plot very closely to the exposition through the visual symbol of drinking. 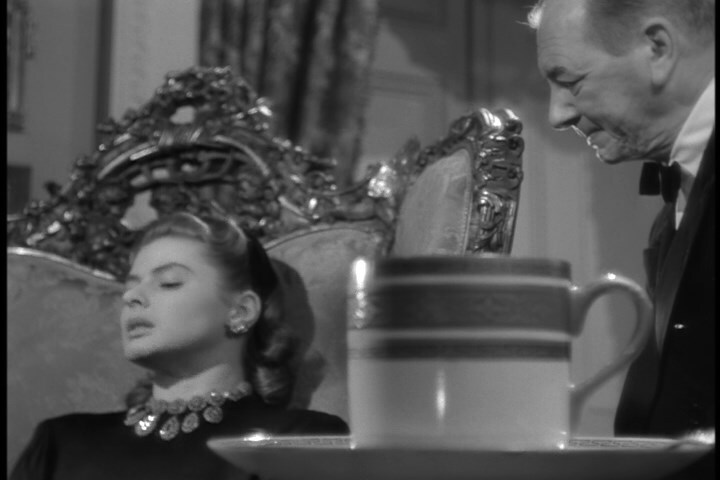 Again, Hitchcock’s economy of storytelling is linked to his economy of visual symbolism. In other films, the passage of time is indicated with such bald images as the hands of a clock moving, or pages flying off of a calendar. Here, simply cutting between a shot of a full cup, to a shot of a pacing and nervous Devlin waiting in vain for his meeting with Alicia, to a shot of a nearly empty cup, at once deftly indicates the passage of time while simultaneously heightening the tension for the audience, who know she is being poisoned. My favorite shot in the whole film. Once again, a character’s key moment of discovery happens when a drink is being shared. Through the carelessness of the guest nearly grabbing the wrong cup, Alicia realizes that she is being poisoned. Wine and Cheese Party for One. 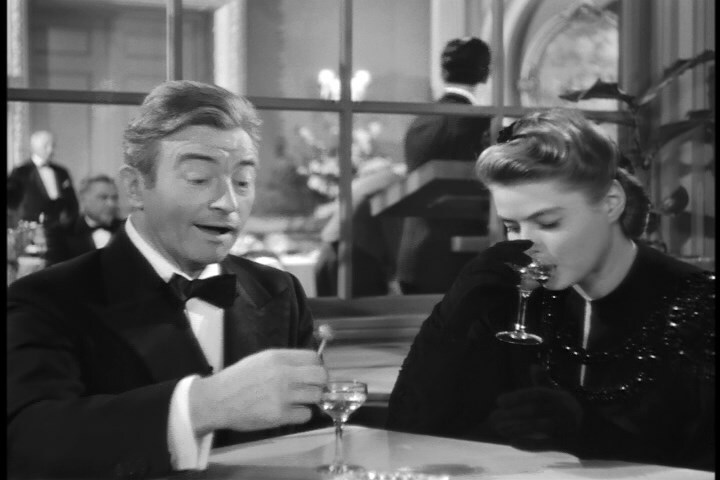 The final shot involving drinking in the film. This serves to illustrate the casual and even callous way that Alicia has been handled by her spy masters. 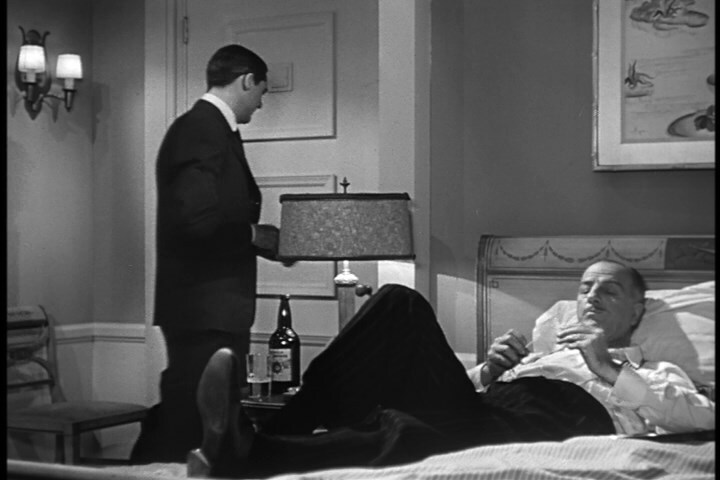 While Alicia lies on her deathbed, watched over by her evil Mother-in-law, Prescott lounges on the bed enjoying a snack and a drink in relaxed comfort, unconcerned with Alicia’s personal fate. I haven’t even touched on some of the other brilliant unifying visual touches, such as the mirrored scenes of silhouetted characters, the shots of characters smoking as they coolly deliberate Alicia’s fate, the shots of descending or ascending the staircase, or the parallel of the famous long-take kiss in the beginning of the film, and the less famous long-take kiss when Devlin rescues Alicia. Or the justly renowned establishing shot of the party which zooms in from a bird’s eye view all the way to a tight closeup on the object in Alicia’s hand… You can discover or re-discover these things for yourself, as surely you must. Since this is part of the Criterion Blogathon, it wouldn’t be right to leave without a few words about the Criterion edition of this film. The 2001 Criterion DVD of this film is the second copy which I have owned, and is sadly out of print. I first purchased the Fox edition when it was released in 2008 as part of a collection of Hitchcock’s early Hollywood films whose rights are now in their hands. The cover art is serviceable, designed to fit in with the other films in the set, Rebecca and Spellbound. 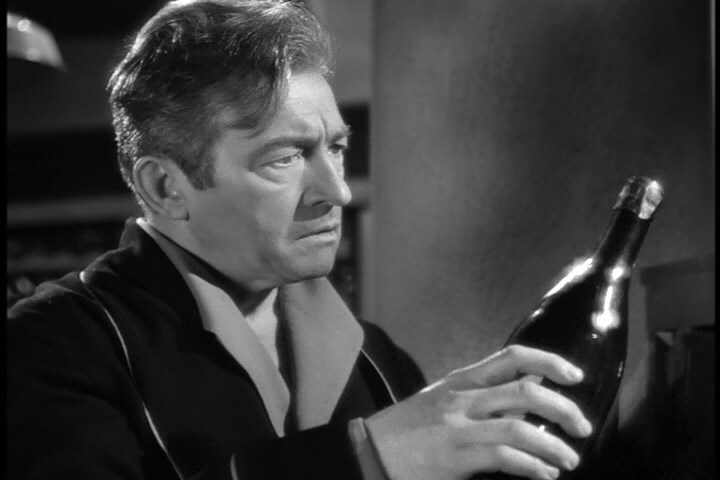 Claude Rains’ expression says it all. Disappointing. If you have bothered to read this far, you can see why the Criterion cover (first image in the post) is so far superior to this one, and indeed is so perfect as to seem to be the only right choice once you have seen it. The care and artistry with which Criterion creates the packaging which houses the extraordinary films in their collection is truly unparalleled in the realm of home video. The true completeist might wish to own both versions, as they contain almost entirely different bonus features, including two separate commentaries on each edition. The Criterion edition has a commentary from Hitchcock scholar Marian Keane, and one from film historian Rudy Behlmer, which I believe originally came from the Laserdisc release. 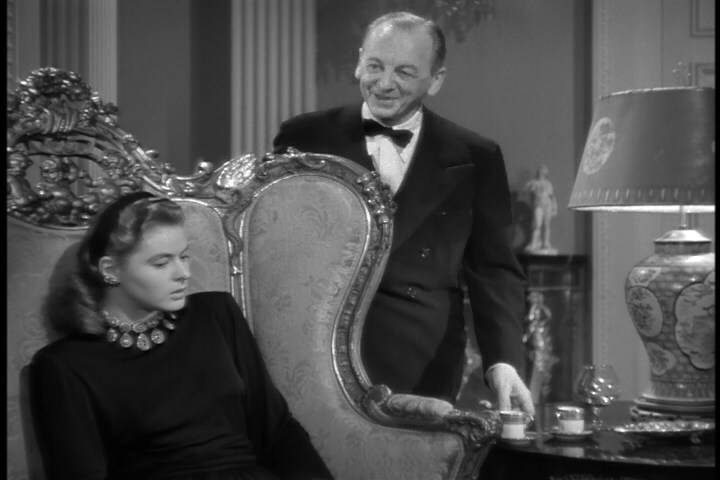 Another notable exclusive to the Criterion DVD is the complete Lux Radio Theatre adaptation from 1948, with Ingrid Bergman and Joseph Cotten. Both versions have a good looking standard definition restored print, but the Criterion one seems to be a bit sharper in focus and generally brighter. In summary, I raise a glass in tribute to this most perfect of Hitchcock’s thrillers. 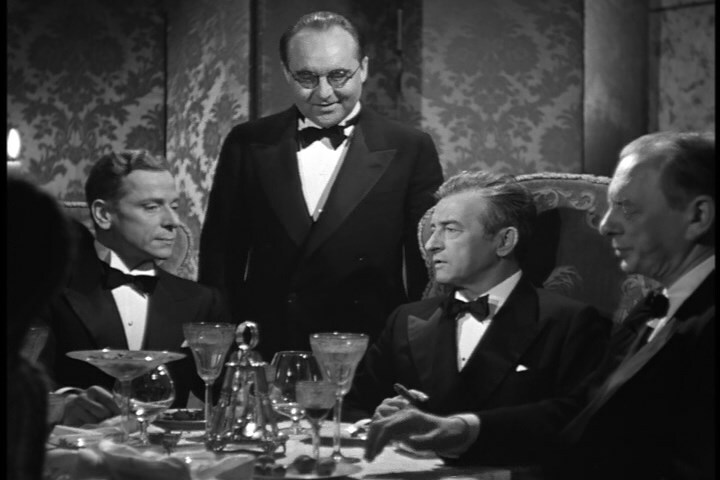 If you have never experienced this rich cocktail, then you owe it to yourself to view this film, a true gem of the Hollywood postwar era, and my favorite Hitchcock film. This film was remade, believe it or not, in the most unlikely of places: Star Wars: The Clone Wars! When I first watched the season two episode, “Senate Spy,” in 2009, I was amazed to discover what was essentially a distillation of the Hitchcock film. Padmé and Anakin take the place of the Alicia and Devlin characters in the Star Wars setting. Unfortunately, while a well meant tribute, the episode suffers from the limitations of the mannequin-like character models trying to sustain far too much dialogue. Nevertheless, this tribute is an interesting testimony to the lasting influence of an iconic film. Posted on November 16, 2015 May 1, 2016 by Joshua Wilson	Bookmark the permalink. Love this movie and your wonderful post. Great analysis of some truly perfect images and filmmaking. Thanks so much for your work on this and being part of this event! Thanks very much! I’m looking forward to reading other entries in this blogathon. Loved this post! Your review was just like a Criterion Extra. I’m going to keep many of your points in mind the next time I watch this remarkable film. Thanks for joining the blogathon with your excellent post. Thanks so much, this has been fun! This is just about a perfect film. Classic Hollywood doesn’t get any better than this. Criterion has always done Hitchcock well. Nice, comprehensive post about a fantastic film. Truffaut knew his Hitchcock! It is a shame that the DVD is out of print, but this is a big enough film that the studios want to cash in. One of my favorite Hitchcock films of all time, and a solid contender for THE favorite. I consider this his ‘smoothest’ film, especially for his direction; his camerawork, framing, and visuals are just so exquisitely done. And I love that final sequence: so full of emotion, and the look Alicia gives Devlin when he walks into her room just flat-out kills me every time I see it. I own that Criterion disc as well, and I didn’t know it was out of print! Nice review, Joshua! Thanks very much for reading, and for your comment. I haven’t seen all of Hitchcock’s films, or even all his Hollywood films, but this is definitely my favorite. It’s always great to see how our response to certain films evolves over time, even though the film is the same. It’s a testament to just how complex some films can be. This film, like all great art, rewards repeated viewings by continuing to reveal new things when you watch it again. Greetings from the Pure Entertainment Preservation Society! This is a fine article. 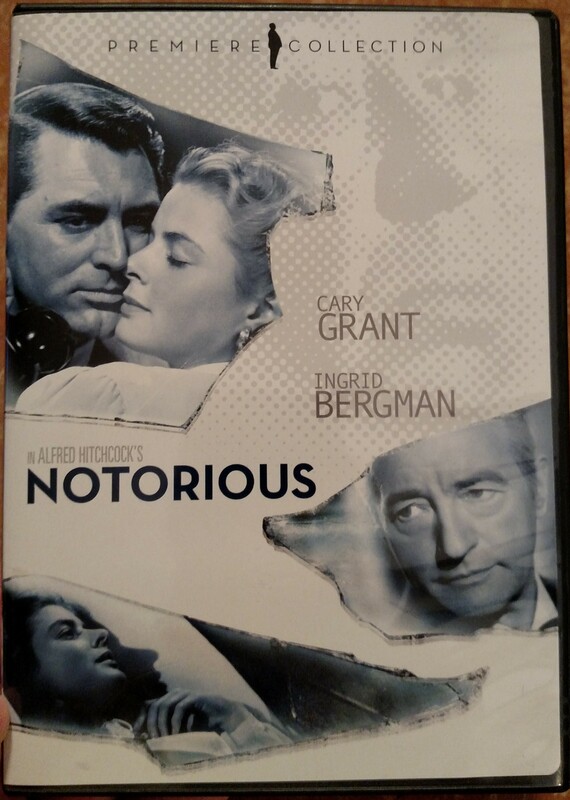 I’ve only seen “Notorious” once that I recall, but it is indeed a dramatic and suspenseful film which features some wonderful acting. I didn’t notice the drink theme, but, now that you point it out, I see what you mean. That is a very clever tie-in which Hitchcock used to keep the film rolling. Thanks for reading, and I appreciate the invitation. Unfortunately, my blog has been a bit slow on activity in the last couple months, but I hope to pick it up again as the spring progresses. I won’t be ready to participate in your blogathon, but I wish you the best with it! Thank you very much for your kind reply. I wish you good luck with your column!